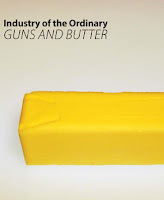 The Visual Arts Gallery at the University of Illinois Springfield welcomes the Chicago-based collaborative team, Industry of the Ordinary, for a provocative performance and time-based installation that consists of a firearm encased in a butter sculpture. The artists for the exhibit “Guns and Butter” will be on campus Thursday, January 31 to conduct the performance aspect of their project in the gallery, beginning at 2 p.m., and to later present a lecture in Brookens Auditorium at 5:30 p.m. A reception will follow in the gallery from 6:30 to 8 p.m. The exhibition will be on display through February 21. All events are free and open to the public. The prolific collaborative duo, comprised of Chicago-based English expatriates Adam Brooks and Mathew Wilson, are known for their thought-provoking performances that challenge perceptions of what is ordinary or every day. 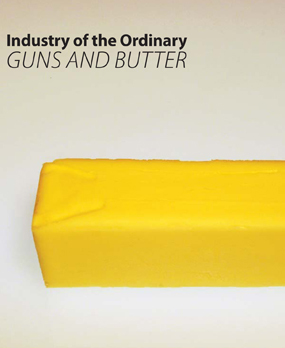 They will work together in the UIS Visual Arts Gallery to construct a butter sculpture around an inoperable firearm. As time passes during the course of the exhibition, space heaters will gradually melt away some of the butter, further exposing the encased rifle. The artists, currently presenting a mid-career retrospective at the Chicago Cultural Center, recently created a butter sculpture of President Obama, and in another performance, toured that sculpture around the streets of Chicago while filming pedestrian response. The butter sculpture created here in the UIS Visual Arts Gallery will be created with the surplus butter that remains from that endeavor, still currently on display in their retrospective, Sic Transit Gloria Mundi. Wilson said he and Brooks want people to become less passive when they view everyday surroundings and to help them look closer at the experiences everyone shares. He went on to note that their work, which sometimes deals with topics like terrorism and infidelity, can be controversial, but pushing boundaries is part of the human experience. During their lecture, Industry of the Ordinary will address the nature of their work, challenging established perspectives on the familiar, and the intentionality behind the deliberate inclusion of a firearm in this exhibit amidst the current and hotly charged dialogue surrounding the topic of gun control. The UIS Visual Arts Gallery is centrally located on the UIS campus in the Health and Science Building, room 201 (HSB 201). Gallery hours are Monday through Thursday, 11 a.m. to 6 p.m. For more information regarding the exhibition, please visit the UIS Visual Arts Gallery website at www.uis.edu/visualarts/gallery, or contact the gallery by phone at 217/ 206-6506 or email alach3@uis.edu.